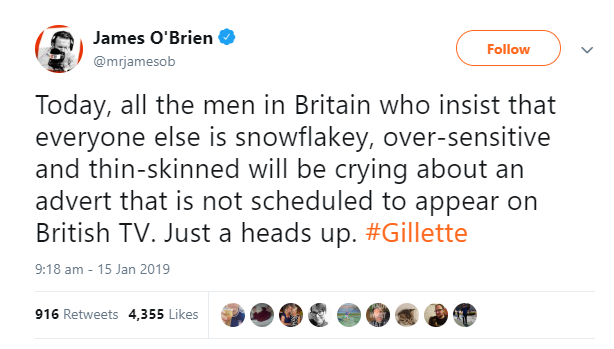 An unusual suspect for controversy by all accounts, Gillette certainly kicked 2019 off with a bang. 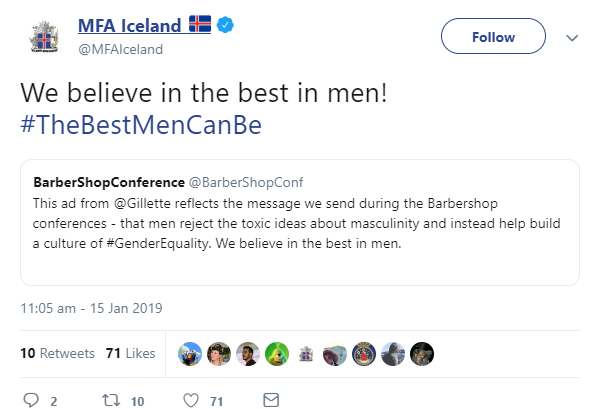 Their advert, ‘We Believe: The Best Men Can Be’, sought to combat toxic masculinity by asking men to call out the detrimental and damaging behaviours of their peers. Our intern, Neil McAvoy, examines the recent advert causing quite a stir. To many the advert is uncontroversial. The statement that men no longer must fall into behaviours that, while deemed ‘masculine’, have been problematic and unhealthy for men and women alike is surely one to be welcomed? As if to confirm the existence of a problem within the psyche of a noisy portion of the advert’s male audience, a fierce and relatively widespread backlash ensued. At the time of writing, the short film version has around 25M views, 678K likes and 1.2M dislikes. While the advert is certainly not without its faults (few ever are! ), it’s hard to, in good conscience, disagree with the message that bullying, harassment and workplace sexism aren’t aspects of society that should be allowed to endure. Nor is the advert wrong in suggesting that these behaviours, at least the latter two, are disproportionally experienced by women. The assertion that men need to act more often to prevent the spread of these behaviours is also accurate. While these truths are hard to deny, they were lost on many men who watched the advert. As the advert’s reception demonstrates, Gillette is also correct to think that these messages have yet to resonate with the parts of society they need to most. Whether a 30 (or 90) second Gillette advert is either the effective or appropriate vehicle to accomplish this is another matter. ARE GILLETTE THE RIGHT FRONT-RUNNERS? 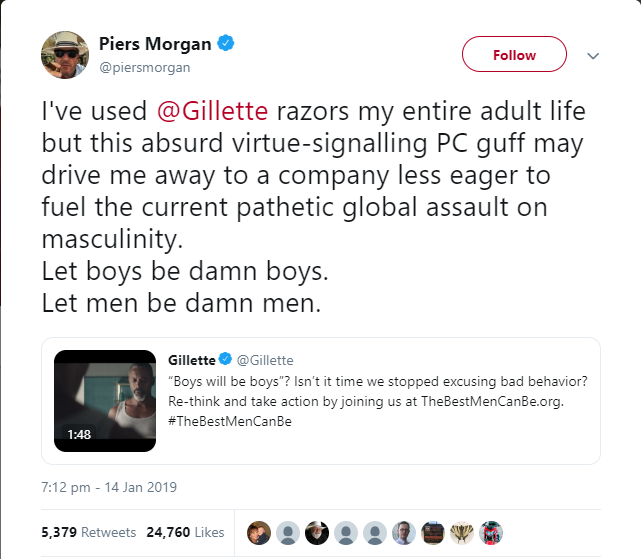 If companies are going to provide this type of social commentary in their adverts at all, should Gillette be the one to do so? On this issue, rationally, yes, they probably should. Gillette is one of the world’s largest marketers to men. Its (potential) influence is huge. They are also donating $1m annually into US non-profits which align with their recently demonstrated ethos. Additionally, Procter and Gamble, Gillette’s corporate overlords, have run similarly motivated adverts on other companies they own in the past. Whether this is for their own gain or society’s, I’ll leave you to decide. SO WHY ISN’T IT RESONATING? Firstly, when most watch the advert, they don’t see this context. Instead, many protectively see the ‘feminisation’ of a male world they have grown accustomed to, feel instantly uncomfortable and react defensively. Others, rightly or wrongly, perceive the advert to stink of virtue signalling. The generally poor execution of the advert doesn’t help either. The acting is far from ground-breaking. Shock horror, I know. The several heavily exaggerated stereotypes and caricatures featured make it challenging for the advert to convey sincerity. A line of men stood BBQ’ing is tricky to take seriously, no matter the context. This trivialises the issue and, while the message remains the same, makes it more difficult for the advert to achieve its goal of changing minds. The short and simple requirements of an advert don’t lend themselves well to a convincing comment on one of society’s longest-running problems. Resultantly, it oversimplifies an issue which, whether you like it or not, can’t be resolved without sensitivity and the appreciation of nuance. It uses the example of two young boys play-fighting to represent toxic masculinity. This is neither accurate or helpful. While short and sweet adverts work relatively well when selling products or experiences, they work less so when trying to change men’s minds and misplaced senses of identity. This has caused many men to miss the point of the advert, unable to see the benefits both men and women will receive from such a change and merely perceiving an attack on ‘masculinity’. Perhaps Gillette’s foray into the realm of social commentary will add itself to a list of examples that prove there is such a thing as bad publicity. 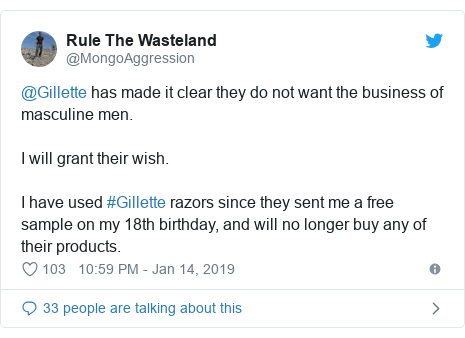 While certainly raising the company’s profile, the advert has created serious uncertainty for Gillette’s brand reputation and sales. It may have also further entrenched the type of men it was trying to reach into their defence of the more unpalatable and disruptive aspects of masculinity. Through gargantuan publicity, Gillette has risked deteriorating the circumstances of each of the matters it set out to better. Bad publicity does exist. Whatever your view, it’s probably worth remembering that it was just an advert. A reality which seems to have been lost on many.